We know that we should be active every day and maintain an active lifestyle, and that this should be one of our top priorities. However, along with everything else we have to do in a day, it can sometimes be difficult to fit in that training session. Being active every day is especially important for an athlete. It may not seem like much, but doing a minimum of 30 minutes of physical activity every day can have a large impact on your overall health and wellbeing! So we know how important it is, but how do we find the time? The solution may not be to find time, but to make it, and it’s not quite as silly as you would think! Physical activity doesn’t need to be complicated, and it doesn’t even need a gym membership. The key is to plan activities that will be easily added to your lifestyle. 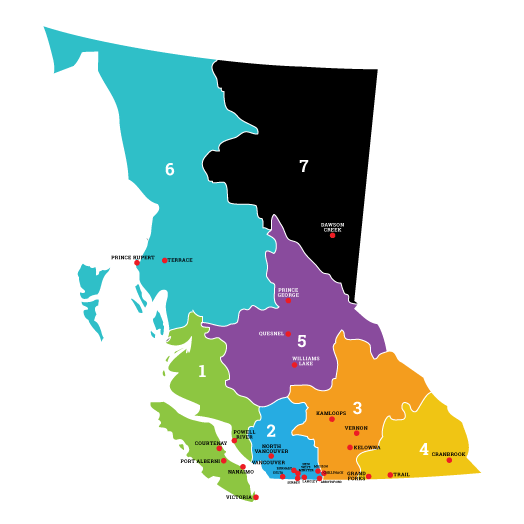 The journey to the 2016 Special Olympics Canada Winter Games in Newfoundland and Labrador is a long and exciting one for the members of Team BC 2016. These athletes have worked hard to advance through Regional Qualifiers and Provincial Games to earn the opportunity to compete at the National Games level. The 51 Special Olympics Team BC 2016 coaches and mission staff members kicked off their countdown to Corner Brook by coming together in Richmond at the end of April. 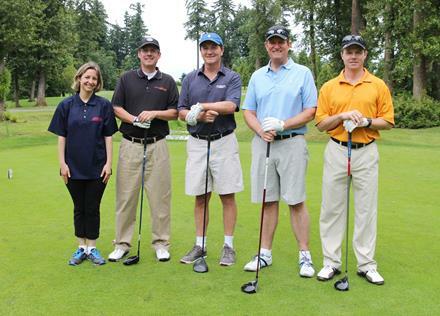 Just a few weeks to go until the Goldcorp Invitational Golf Tournament in support of Special Olympics BC! One of Vancouver’s premier golf events, the fully stocked tournament returns to Northview Golf & Country Club on June 16. 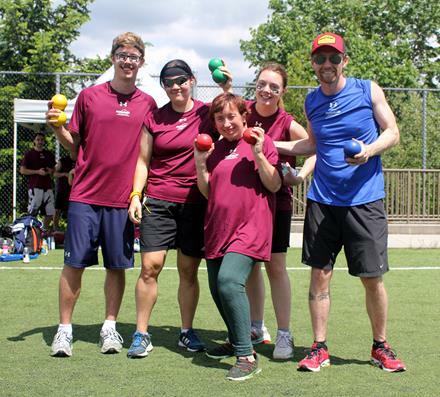 All of the tournament’s teams and major sponsorships are sold out, but supporters can still help make a difference for SOBC through this valuable event by donating auction items or tee sponsorships. Please contact Christina Hadley by e-mail or by phone at / toll-free. The BC Law Enforcement Torch Run will take to the streets in communities around the province throughout June! Get ready to cheer on these champions of respect and inclusion running to raise awareness and funds for Special Olympics. 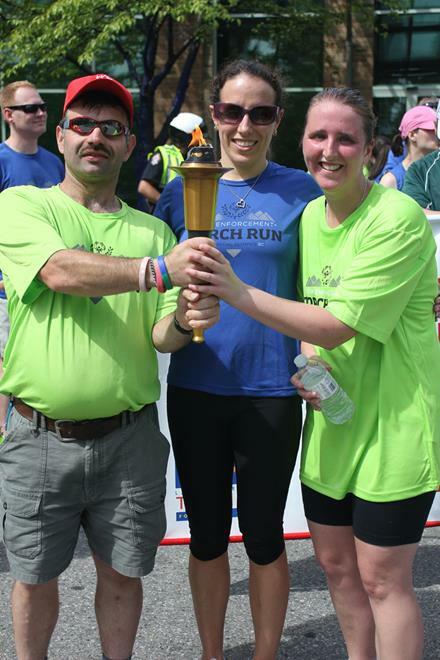 The fun starts with the Lower Mainland Torch Run June 2 to 5 and the Prince George Torch Run on June 4. Click here for details on the exciting Torch Run events coming soon in the Lower Mainland, Prince George, Victoria, Cranbrook, and Nanaimo! In Vancouver, supporters can join the fun by lacing up with the Granville Kilometre, making a statement for Special Olympics in the heart of downtown on June 3 – please click here for the registration form. In Victoria, community members are welcome to participate in the fun run/walk and pancake breakfast on June 13 – please click here to register online. 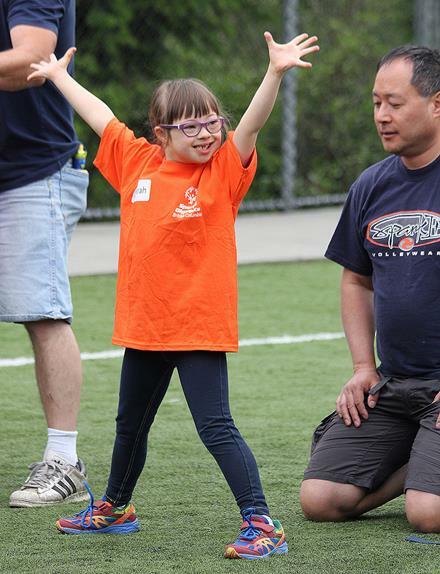 Big thanks to the 68 young athletes, families, and volunteers who took part in Special Olympics BC’s Youth Sports Day on May 23 and made it such a fun and rewarding experience! Held at the EA Sports complex and supported by great EA and SOBC volunteers, the event was a big hit with the largest number of participants yet. Youth Sports Day gives children with intellectual disabilities a chance to give SOBC’s fun and welcoming youth programs a try, and the warm responses were wonderful to hear. Our sincere thanks go out to all Staples staff and customers who supported Special Olympics in the 15th year of the Give a Toonie. 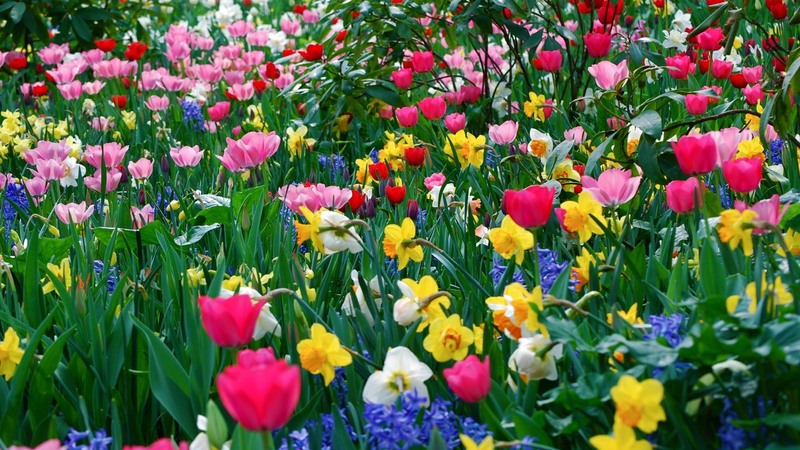 Share a Dream. campaign May 2 to 24! We are also tremendously grateful to the SOBC athletes and volunteers all over the province who visited local stores to support the fundraising efforts and made such a difference. 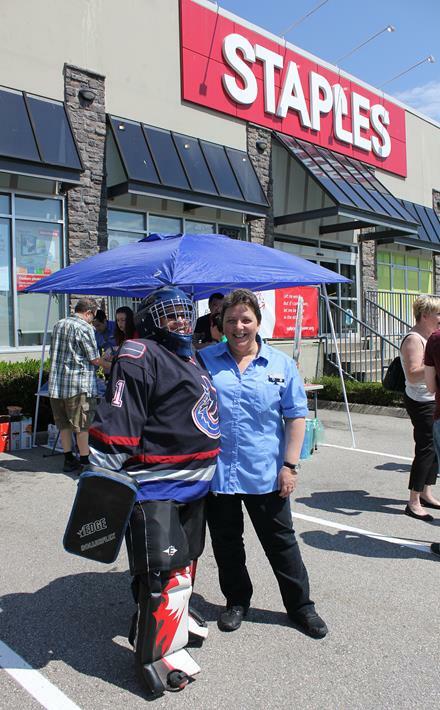 Early accounts indicate the campaign was a great success again this year, with strong fundraising province-wide and wonderful stories of shared respect between Staples staff and SOBC athletes. Thanks to all for making dreams happen! After the Special Olympics Team Canada 10-pin bowling training camp, SOBC – Penticton bowler Jake Huff came home with a great feeling about the group of people with whom he’ll be competing in the 2015 Special Olympics World Summer Games. “I believe the bowlers for Team Canada are a very positive team. I think the 10-pin people are a very powerful group. … I couldn’t be more happy to be with them,” Huff said. Special Olympics Team Canada members, including most of the 57 athletes and 18 coaches and mission staff from B.C., have been participating in training camps across the country over the last three months as part of the build-up on their road to Los Angeles. 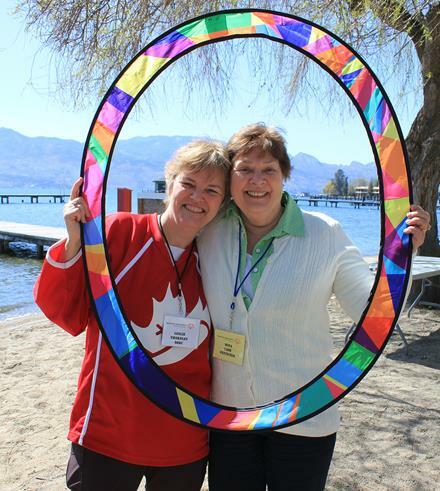 Pictured at right: Team Canada mission staff Leslie Thornley and bocce coach Dona Cade of SOBC with the LA 2015 Circle of Inclusion. In June, Special Olympics BC is hosting functional testing sessions around the province open to all SOBC athletes, designed to provide important individual feedback on form and techniques and helps generate data to track personal progress. Get involved to help raise your game! Please click here to check out the details for athletes. 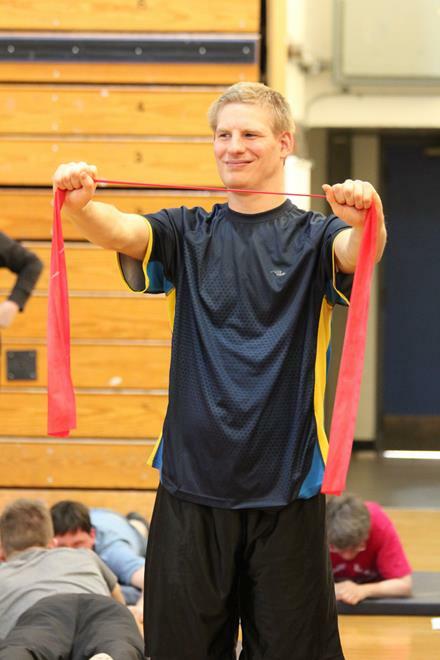 Volunteers with a background in kinesiology, human kinetics, or personal training are also welcome to get involved. Please click here for more information for volunteers. 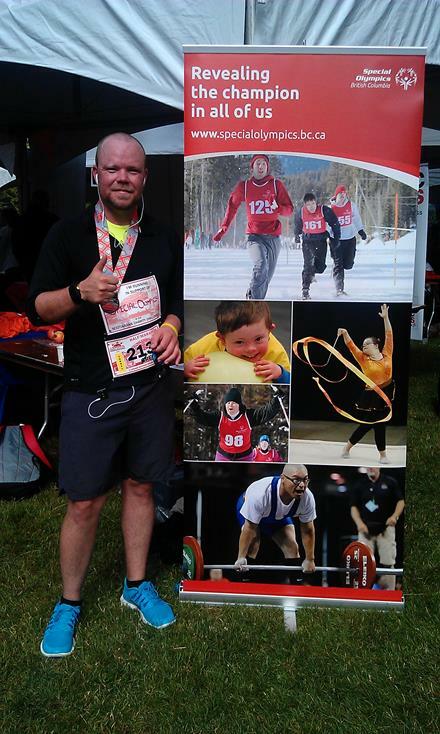 motionball‘s two inspiring and fun Marathon of Sport events in B.C. are back this June! This year Marathon of Sport organizers want to raise $60,000 with the Vancouver event on June 6, held at the amazing EA Sports complex, and $75,000 with the fast-growing Kelowna Marathon of Sport presented by Interior Savings Credit Union on June 20.
motionball’s Marathon of Sport events are fun, inclusive days filled with sports and great spirit where young professionals compete alongside local Special Olympics athletes, forging amazing bonds and raising funds for the movement. Meet a Marathon of Sport Vancouver team in this inspiring video and dedicated Marathon of Sport Kelowna Co-Event Director Donnie Ungaro in this profile. 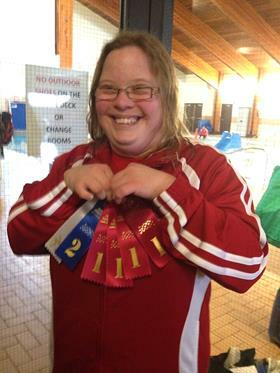 We’re delighted to congratulate Special Olympics BC – Chilliwack volunteer Kathie MacDonald and SOBC – Kamloops athlete Dallas Gilchrist who have been recently recognized in their communities for their contributions to Special Olympics and outstanding achievements! 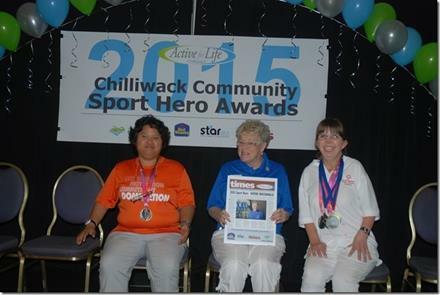 MacDonald is pictured at right with Chilliwack athletes Lisa Newell and Melinda Franson. We are also very pleased to celebrate Christina Hadley, SOBC Vice President, Fund Development & Communications, who this month marked 25 years as SOBC staff. Thank you for all your remarkable work and dedication to Special Olympics! Summer met winter when Special Olympics BC athletics and snowshoeing athletes and coaches from around the province came together in Richmond on May 9 and 10 for the first Performance Program training camp to combine both winter and summer sports! Working with sport experts and learning from each other, all participants demonstrated fantastic skill-building and dedication. We are very grateful to RBC Foundation for generously donating $20,000 to support the Performance Program. Sincere thanks also to the Government of Canada for their significant support of the program, helping athletes and coaches excel. There’s lots more Performance Program action to come, with the first golf training camp being held this weekend and more events coming throughout June and the summer. Skill-building videos developed at the camp are being posted in the Resources section on the SOBC website, so they can be used by all coaches and athletes. 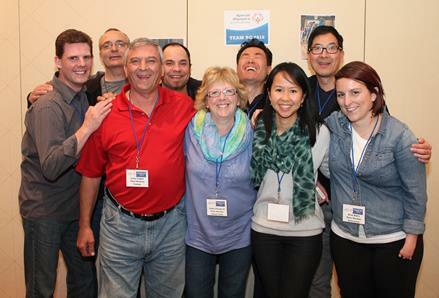 The Canadian Progress Club of Greater Vancouver has generously supported Special Olympics BC for more than three decades. Their annual summer events benefitting SOBC are coming up soon, and we can’t wait! 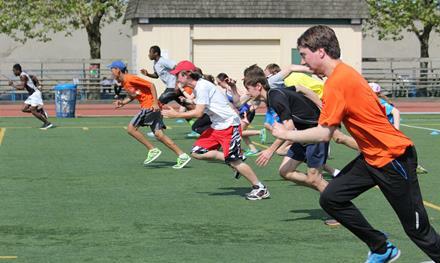 The Vancouver Sun Harry Jerome International Track Classic has an illustrious 32-year history on the Canadian track and field scene, and this year will include Special Olympics events for the first time. 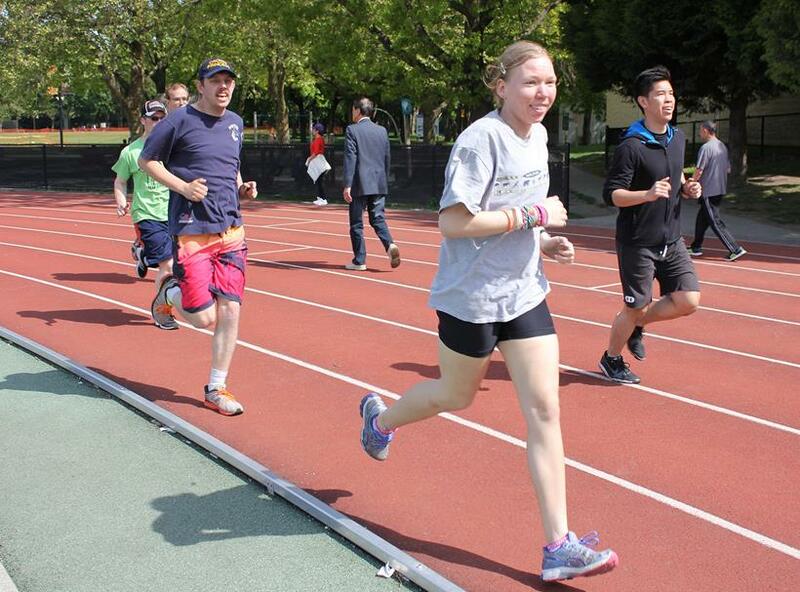 Sixteen Special Olympics BC athletes (eight men and eight women) will race 100-metre events at the June 8 meet at Burnaby’s Swangard Stadium. 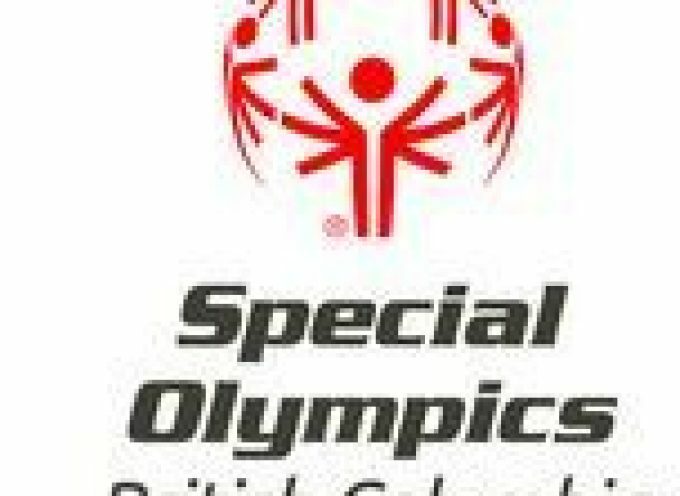 The SOBC athletes will hit the track alongside nearly 400 athletes from 16 countries, including 32 Olympians and elite athletes seeking to finalize qualification to race in the 2015 Pan Am Games in Toronto this summer. 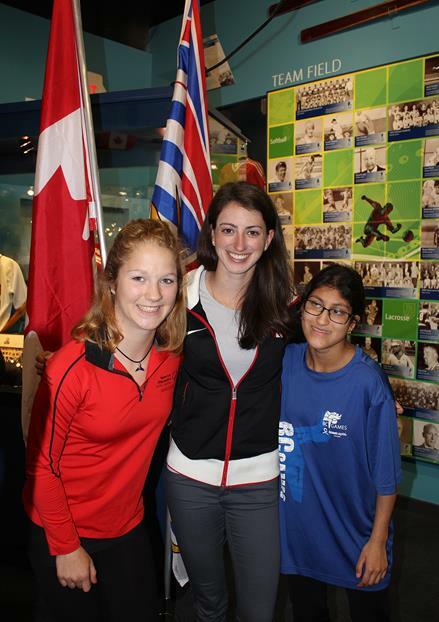 Pictured at right: SOBC athletes Tamika Shaw (left) and Suraya Pittalwala (right) with Olympian and SOBC – Burnaby coach Jessica Shaw at the Harry Jerome Track Classic media event. Knowing that he was running for Special Olympics gave Greg Mather the “extra oomph” he needed to finish his 21.1 kilometres in last year’s Scotiabank Vancouver Half-Marathon & 5k. 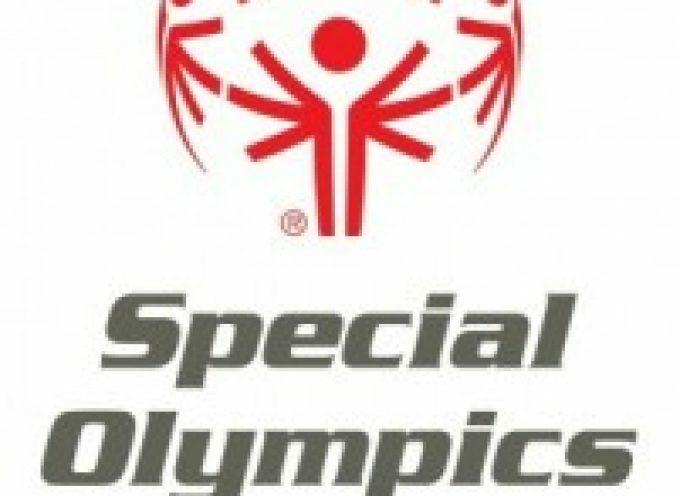 Mather is one of 23 Special Olympics BC volunteers, athletes, and supporters who have signed on to participate in the 2015 SVHM Charity Challenge to raise funds for SOBC or their Locals. This year will be Mather’s second Scotiabank Vancouver Half-Marathon, after a very successful first outing last year where he raised more than $1,200 for Special Olympics BC – Kelowna through the race. Another opportunity to combine a beautiful run with fundraising for Special Olympics is coming up in October in Victoria. This year, for the first time, SOBC has joined the Charity Pledge Program in the GoodLife Fitness Victoria Marathon, coming October 11. We’re looking forward to seeing runners on the Island support Special Olympics! Please contact Charlotte Taylor by e-mail or by phone at / toll-free to raise funds in this exciting new opportunity. 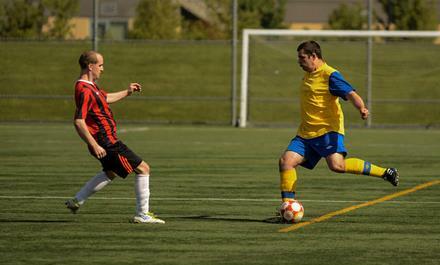 Thanks to our friends at BC Soccer, Special Olympics BC soccer teams had the opportunity to play a showcase match again this year at the BC Soccer Adult Provincial Championships! Talented members of the Special Olympics Team Canada soccer team took the field against strong opponents from SOBC – Abbotsford in a great game. The Knights of Columbus are a valued Special Olympics International partner and we appreciate their support here in B.C. The Knights of Columbus Campaign for People with Intellectual Disabilities has been in existence since 1970, with many states and provinces participating, both in the U.S. and in Canada, in support of those with intellectual disabilities. In B.C. and the Yukon, this program ran for the first time in the 2013-14 fraternal year. Knights of Columbus members from various Councils within Districts give away free Tootsie Rolls and collected donations as part of the Knights’ province-wide efforts to raise funds to support people with intellectual disabilities. Watch for the Knights of Columbus campaign for individuals with intellectual disabilities coming up in communities such as North Vancouver June 5 to 7! The BC/Yukon Knights of Columbus also recently welcomed SOBC – Richmond athlete Ryan Stewart to share his Special Olympics experiences with the significant gathering of Knights in the 104th British Columbia and Yukon State AGM and Convention in Richmond. You’re receiving this because you are a member or supporter of Special Olympics BC.